There’s a lot to talk about since the Sunday when a 64 year old man with no prior criminal record or apparent axe to grind killed 58 people and injured over 500 more by shooting at a large crowd attending a country music festival. Let me start by again offering my condolences to all those affected. This incident becomes more visceral for me each time I am acquainted with the victims, their families and friends. In my first post on this topic I said I was interested in the shooter’s motive. As of today none has been discovered, or if one has been discovered, it has not yet been reported. I will not be surprised if it turns out that this nut, a guy named Stephen Paddock, turns out to be a terrorist of some stripe. In other words, that his motivation to kill was to further some political goal. That’s the difference, at least in Federal law, between an act of terrorism and other violent acts not associated with a political goal. The reason I think that the shooter was motivated by politics is that there doesn’t seem to be any other motive, and the extreme nature of his actions are inconsistent with his background. For example, he had no criminal record and according to news reports he is somewhat wealthy. Add to that his age at the time of the shooting and the whole thing doesn’t add up. I mean, who, at the age of 64, just up and decides one day to murder and injure a bunch of random people? I used to assess workplace violence threats as part of my job and the way you do the assessment is to use a matrix of indicia. Does the employee have a grievance against the employer? Does the employee have a history of violent behavior? Are they in the middle of a personal crisis involving, for example, finances or relationships? Have they verbalized threats to co-workers or others? This list of indicia is not comprehensive but you get the idea. The only indicia in this guy’s case is that he had access to weapons. Other than that you get a giant goose egg. Now let’s talk about gun control. And no, it’s not “too early” to talk about that, because gun control is an overarching issue that doesn’t relate to this mass shooting in particular, but to the arc of increase in mass shootings in the United States generally. One encouraging sign that has emerged in the aftermath of this shooting is that, for once, the National Rifle Association and both major political parties seem to be in agreement that so-called “bump stocks” should be outlawed. For those who haven’t been following the news reports, a “bump stock” is a device that modifies a semi-automatic weapon such that it acts like a fully automatic weapon, or machine gun. The Vegas shooter had modified several semi-automatic weapons using the bump stock device, such that he had several fully automatic weapons at his disposal for use during the massacre. Beyond agreement on that one measure, the parties have backed into their usual corners, with Democrats in using the opportunity to advocate in favor of stricter gun control and Republicans (and the NRA) trotting out the usual talking points about how this particular shooting would not have been prevented by, for example, universal background checks. It’s true that the Vegas shooter passed all of the required background checks for purchasing the weapons used in the massacre. But the problem with that argument is that it is anecdotal and, moreover, doesn’t hold up from a common sense perspective. I mean, background checks are already required for most gun purchases, so presumably the government thinks they are a good idea. Common sense tells you background checks are a good idea. So then why would it make sense to have loopholes for gun shows? Another measure that, at least to me, makes sense is to question why a gun purchaser needs to have several of the same type of weapon. The Vegas shooter had several high powered rifles that he had purchased in the months leading up to the massacre. Some might argue that gun enthusiasts (e.g., collectors) should have a right to own as many weapons as they want, but it doesn’t make sense that a collector would, for example, buy several weapons of the same make and model. At the very least authorities should be able to know when such purchases are occurring and have an opportunity to question the purchaser as to the reason why they want multiples of the same type of gun. In the case of the Vegas shooter, he apparently wanted multiple high powered rifles with the bump stock modification because if he only had one of them the gun barrel would melt down at a certain point due to the heat generated. With multiples of the same gun he could simply swap out for a new one and continue the massacre. Now read that carefully. The stated reason for the right to bear arms is because it is “necessary to the security of a free State.” This is consistent with something that occurred to me when I was on vacation in New England and took a tour that went from Boston to Concord, or what is referred to as the revolutionary “battle trail.” Many Americans know the famous story of Paul Revere alerting the colonists in the middle of the night that the British army was coming. What many don’t know is why they were coming. In short, the colonial leaders, including John Hancock and Samuel Adams, and the colonists in general, were angry because the British (i.e., the King) had instituted taxes on various imported goods, including tea, in order to fund England’s war with France. That anger came to a head when the colonists dumped tea into Boston harbor, in what is known as the Boston tea party. The King was worried that the anger would lead to insurrection and ordered that the colonists’ guns be confiscated. Word of the King’s intentions leaked to the colonists, who then gathered up all the guns in Boston and hid them in Concord. Then, word leaked to the British army that the colonists had hid the guns in Concord, and the footrace was on. The colonists (or Minutemen) and the British army regulars confronted each other about half way between Boston and Concord, at the town of Lexington, and a battle ensued in which several combatants were killed, and thus began the Revolutionary War that ultimately led to the creation of the United States. Given this history, you can imagine why the drafters of the Constitution wanted an amendment that guaranteed the “right of the people to keep and bear arms.” But the right to keep and bear arms wasn’t so that people would have those weapons for personal protection. As stated in the Second Amendment, it was “necessary to the security of a free State.” In other words, having lived through the experience of having a government (the King of England) try to confiscate their weapons, they saw it necessary to prevent a government (of the United States) from doing so at some later time. To summarize, the right to bear arms is not so that you can use those arms for your personal protection; it is so that you aren’t living in a tyranny. So, you might forgive those who are suspicious of a national gun registry, it being the Federal government and all. Confiscation could be possible (however unlikely) if the Feds knew who had what. Personally, I think that’s a paranoid reaction that should not inform public policy. But that’s just me, and I respect those who hold a different view. I think it’s important for all of us to be respectful of each other’s views in order for this discussion to bear fruit. My condolences to all the victims of the horrific shooting incident in Las Vegas last night. In a time when people are so divided, at least we can all come together in our sadness. I’ve attended outdoor concerts at a venue similar to, but much smaller than, the venue where the shooting took place. There is an outdoor concert facility in South Lake Tahoe next to a hotel tower. Sometimes people book rooms at that hotel so they can watch the show from their hotel room. In fact, the rock band Weezer is playing there on October 5th. I’ll be interested to see what, if any, changes are made to the security arrangements in light of what just happened, or whether the show might even be cancelled. I wonder how the shooter came into possession of a machine gun, which you can hear clearly on the many videos they are showing on TV. That’s one of many questions that need to be answered in the coming days and weeks. The main question I have is the shooter’s motivation. So we went out target shooting in the forest. This is a photo of the first time I fired a gun. It was fun…and cold! The outside temperature in the forest was 20 degrees fahrenheit. 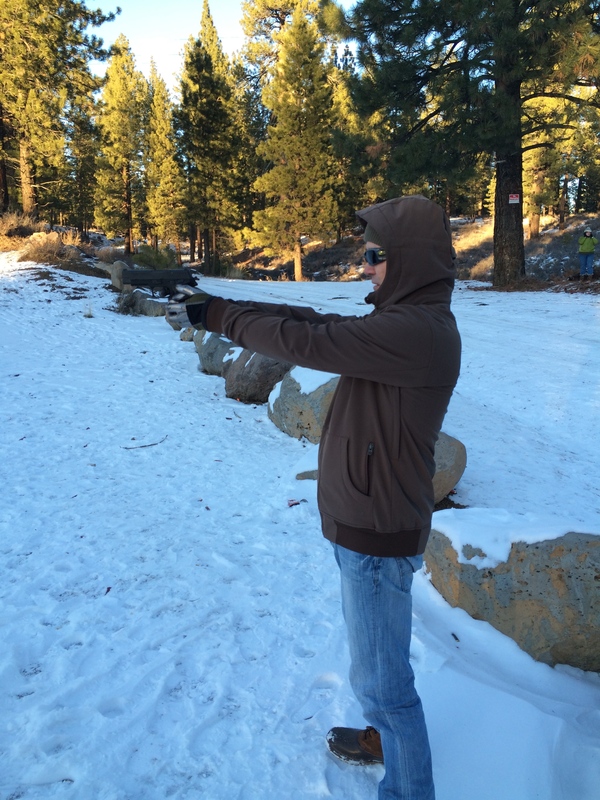 I had light gloves on, but my fingers became numb quickly, which didn’t impact my ability to fire the gun, but did make it hard to reload the magazine. I can see why people like to shoot at targets, like a sport. I imagine you can get really good if you practice a lot. Shooting at wildlife? I think that would take training, or in my case, a different type of personality. I can’t imagine shooting a gun at a living creature, well, unless it was trying to attack me. But then it’s not like I’m going to be carrying a gun around everywhere in anticipation of that type of scenario. And I wonder if a gun would be a good form of personal protection from crime, at least for me. I have a burglar alarm at my house that calls the security company if someone breaks in. After my experience today it made me think what I would do if I had a gun in the house and someone did break in. I wouldn’t know if they were armed but would assume they were up to no good. I guess that’s where the phrase “shoot first and ask questions later” comes from. It’s a conundrum, for sure. I’m going to think long and hard before any decision to buy my own. It would be fun to go to the firing range, but I think there’s a lot of anxiety that flows from the responsibility of gun ownership.